Two Rivers Bridge spans the Colorado River at its confluence with the Roaring Fork River and provides pedestrian access to Two Rivers Park. 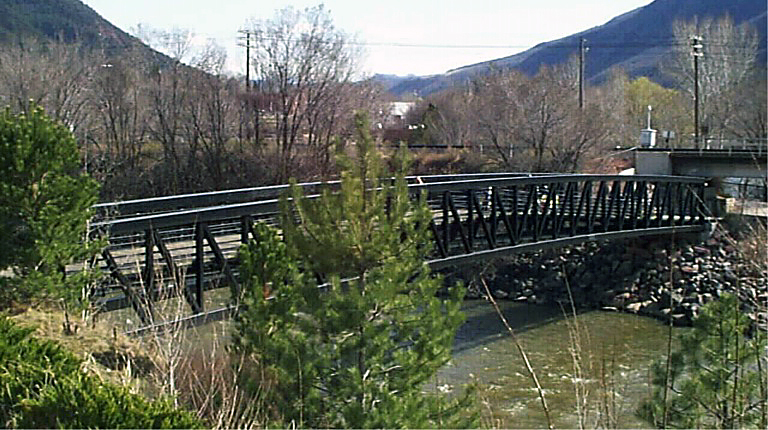 At the time of the bid, the City of Glenwood Springs had ordered the bridge for Steadfast Bridge, but the designers had not come up with a solution regarding how to erect it. Crane access to the south side of the Colorado River was not thought to be possible. The second place contractor proposed to put the south end of the bridge on a D9 cat and drive it across the river. We constructed a temporary retaining wall on the south side of the river and removed some of the embankment under the train trussel to allow the 165-ton crane access to the south side. The 190ft span bridge had a dead weight of 147,000 pounds.